The tangy flavor of real sour cream and the rich taste of mushrooms come together in our Stroganoff Pasta Sides, the essential ingredient in our wonderful Easy Beef Stroganoff. Stroganoff Pasta is rated 4.5 out of 5 by 90. Rated 5 out of 5 by breezyk26 from Must Do Recipe on Back for Philly Steak The recipe on the back of this package for Philly Steak is amazing. I added a few extras to my liking but it made a simply amazing meal my husband Loved! I used thinned sliced roast beef for sandwiches that you buy in the sandwich meat section and sauteed it with about a tsp of Worcester sauce and peppered it with Lawry's Garlic Pepper. I removed it from the pan and sauteed my green pepper and onions then removed those and sauteed mushrooms. I removed those from the pan and prepared the Pasta Stroganoff as directed. Then add back the peppers, onions, mushrooms and beef. Top with 5 round slices of Provolone Cheese and put lid on pan and let cheese melt. I served with a side of cheesy garlic buscuits I made from a Bisquick mix. Oh my yummyness! Rated 5 out of 5 by Oltl4evs from My favorite side! 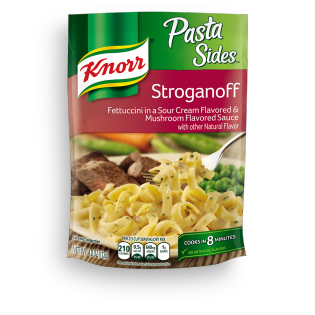 Stroganoff is so comforting, and Knorr knocks it out of the park with this one! Rated 3 out of 5 by VegasShopper from Time for an update! Knorr has always been one of my favorite brands for flavor and quality. But now that my husband has had 2 cardiac episodes, I'm much more aware of sodium content. Thy need to dial back the amount of salt in this and all other products. Rated 5 out of 5 by Anonymous from This is my FAVORITE. I love this stuff. I’ll literally throw some chicken in it and eat it as a meal. It’s amazing. I love this flavor!! And it’s so affordable and easy! !